British scientific experts have made a major breakthrough in the fight to save the natural world from destruction, leading to an international effort to safeguard a global system worth at least $5 trillion a year to mankind. Groundbreaking new research by a former banker, Pavan Sukhdev, to place a price tag on the worldwide network of environmental assets has triggered an international race to halt the destruction of rainforests, wetlands and coral reefs. With experts warning that the battle to stem the loss of biodiversity is two decades behind the climate change agenda, the United Nations, the World Bank and ministers from almost every government insist no country can afford to believe it will be unaffected by the alarming rate at which species are disappearing. The Convention on Biological Diversity in Nagoya, Japan, later this month will shift from solely ecological concerns to a hard-headed assessment of the impact on global economic security. The UK Government is championing a new system to identify the financial value of natural resources, and the potential hit to national economies if they are lost. The Economics of Ecosystems and Biodiversity (Teeb) project has begun to calculate the global economic costs of biodiversity loss. Initial results paint a startling picture. 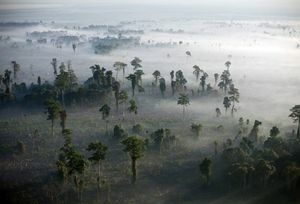 The loss of biodiversity through deforestation alone will cost the global economy up to $4.5trn (£2.8trn) each year – $650 for every person on the planet, and just a fraction of the total damage being wrought by overdevelopment, intensive farming and climate change. The annual economic value of the 63 million hectares of wetland worldwide is said to total $3.4bn. In the pharmaceutical trade, up to 50 per cent of all of the $640bn market comes from genetic resources. Anti-cancer agents from marine organisms alone are valued at up to $1bn a year. ast week, a study by the Royal Botanic Gardens at Kew, the Natural History Museum in London and the International Union for Conservation of Nature suggested more than a fifth of the world’s plant species are threatened with extinction. The coalition hopes that linking the disappearance of biodiversity to a threat to economic stability will act as a “wake-up call”. The Government, working with Brazil, will use the 193-nation summit in Nagoya on 18 October to push for an agreement on sharing the benefits of biodiversity. They hope to thrash out an early draft of a deal which would ensure that regions rich in natural resources, including South America, Asia and Africa, receive the benefits enjoyed by developed countries. In many parts of the world, the survival of the natural environment is a matter of life and death for the people who live there. Forests contribute directly to the livelihoods of 90 per cent of the 1.2 billion people living in extreme poverty. Half of the population of the developing world depends indirectly on forests. The breakthrough in the battle to persuade countries worldwide to sign up to the biodiversity agenda is the development of Teeb, part-funded by the British, German and Norwegian governments, which calculates the value of nature and the cost of its loss. Developed by Mr Sukhdev, an Indian banker turned environmental economist, its data will be broken down by countries and regions. “‘We must all work towards making the meeting in Nagoya a decisive moment in history,” Mr Sukhdev said. Who better to put a value on global biodiversity than an international banker with environmental credentials? Pavan Sukhdev, who spent much of his career working in international finance, was first approached by the EU Commission and Germany in March 2008 when he was with Deutsche Bank in India, and asked to measure the economic cost of the global loss of biodiversity. Latests findings of the study were presented at the United Nations last month. It was widely praised in environmental circles for its ability to model the impact of a loss of biodiversity on global rates of poverty and economic inequality. Mr Sukhdev is leading a team of scientists in the project backed by the UK’s Department for Environment, Food and Rural Affairs, along with the German, Norwegian, Dutch and Swedish governments. Prominent figures include Defra’s chief scientific advisor, Prof Bob Watson, who is a leading expert on biodiversity. Mr Sukhdev was involved in environmental projects in his native India, including sitting on the board of the Bombay Environmental Action Group and working alongside the Indian States Trust to develop “green accounts” for businesses that also consider the environmental impact of economic development. In 2008, he took a sabbatical from Deutsche Bank to become a special adviser to the United Nations Environment Programme, overseeing three programmes measuring the combined economic cost of global ecosystem degradation and biodiversity loss. In his spare time he manages a model rainforest restoration and ecotourism project in Queensland, Australia, and farming in southern India.